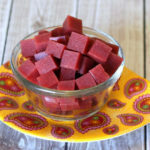 Nothing artificial or processed in these homemade fruit snacks - just fresh fruit, a little fruit juice, maple syrup for sweetness and unflavored gelatin. I’ve got a super easy, super fun recipe over at Ask Anna today. Homemade fruit snacks! Yes, homemade. From scratch. Nothing artificial or processed in these little guys. Just fresh fruit, a little fruit juice, a splash of maple syrup for sweetness and unflavored gelatin. I only use the good stuff. Gelatin from grass-fed cows and it’s 100% protein. These fruit snacks are simply 100% delicious! With Easter coming, this would be a great treat to make for your kids. No added refined sugars and no dyes. Just pure goodness. I tried them using strawberries and mangos. My kids went for the strawberry and I went for the mango. Both yummy! Trust me. Once you make these homemade fruit snacks, it will just feel like a crime buying them in the store. Homemade is ALWAYS better! 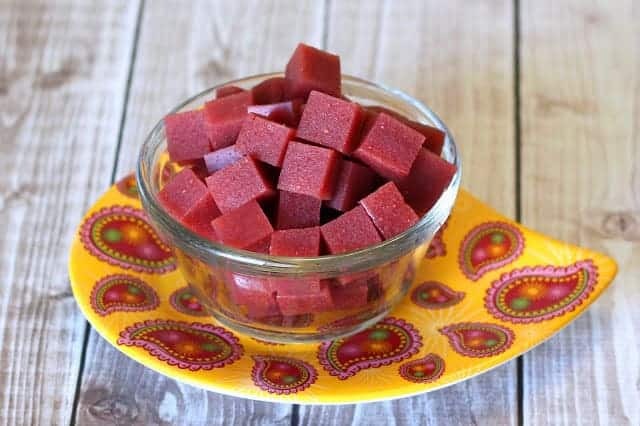 There's nothing artificial or processed in these homemade fruit snacks - just fresh fruit, a little fruit juice, a splash of maple syrup for sweetness and unflavored gelatin. Prepare 8-inch baking dish* by lining with parchment paper (for easy removal). In medium saucepan, add fruit, orange juice and maple syrup. Cook over medium-low heat, just to soften fruit. Turn off heat and carefully pour mixture into blender or food processor. Puree until smooth. Pour mixture back into saucepan. Turn heat to low and slowly add gelatin. Continue to whisk until gelatin is completely dissolved and no clumps remain. Pour into prepared pan. Place in refrigerator for about 1-2 hours, until set. Remove from pan and cut into 1/2-inch squares (a pizza cutter works great!). Store in air-tight container. These fruit snacks to not have to be refrigerated, but we prefer to keep them chilled. This entry was posted in Appetizers & Snacks, Recipes, Recipes & Techniques by Cooks We Love and tagged autism, autism diet, autism gluten free, autoimmune disease, celiac, celiac disease, celiac health, food allergies, fruit snacks, g-free, G-Free Foodie, gluten allergy, gluten free, gluten free baking, gluten free cooking, gluten free diet, gluten free dining, gluten free food, gluten free holidays, gluten free mommy, gluten free parent, gluten free parenting, gluten free snacks, homemade. Bookmark the permalink.